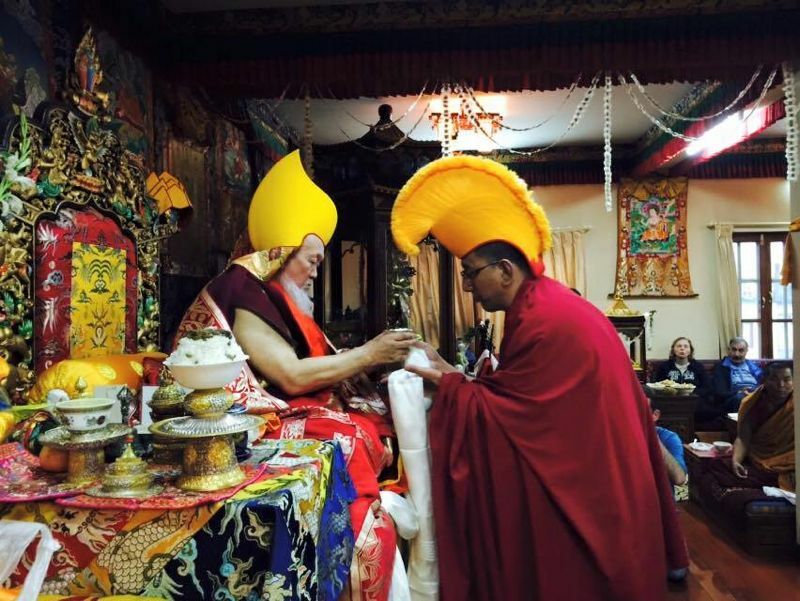 His Holiness the 11th Panchen Lama Bainqen Erdini Qoigyijabu recently bestowed the Kalachakra initiation at his New Palace near Tashi Lhunpo Monastery in Xigaze (Shigatse), southwest of the Tibet Autonomous Region of China. This is the first Kalachakra initiation to be held publicly in Tibet/China in the last 50 years and the historic first Kalachakra initiation presided over by the young Panchen Lama. 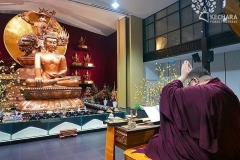 The initiation formally began on 21 July 2016 with 40 monks beginning a closed-door observance of the self-initiation of the Kalachakra deity on Thursday morning. 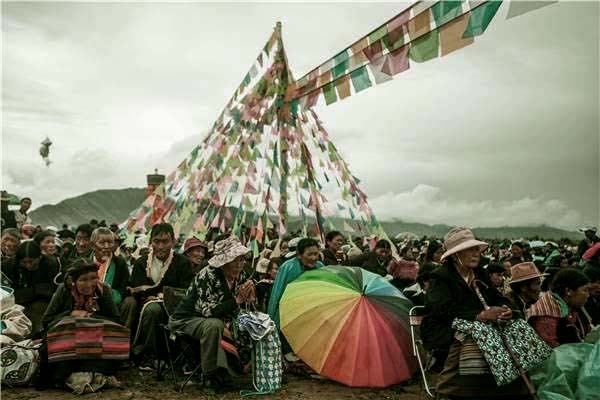 The monks from Labrang Monastery in northwest China’s Gansu Province and Tashi Lhunpo Monastery, assisted in this ritual every morning throughout the four-day event. 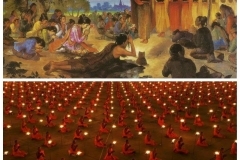 Over 100,000 attended the initiation and teachings, which included over 5,000 monks and nuns and 100 incarnated lamas and teachers. 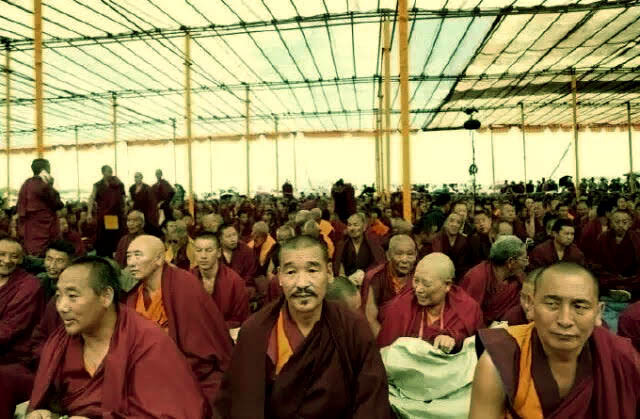 Amongst the lamas in attendance were His Eminence the 20th Denma Gonsa Rinpoche, His Eminence Nyitrul Rinpoche, Venerable Lama Jampa Ngodrub Rinpoche also known as Lama Wangchuk, and many other eminent masters. 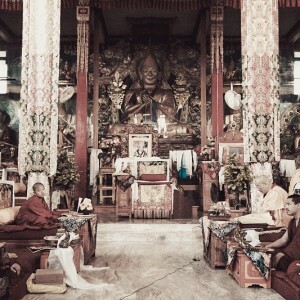 The famous Lama Jampa Ngodub or Lama Wangchuk (with moustache) is sitting amongst Geshes and various other teachers. 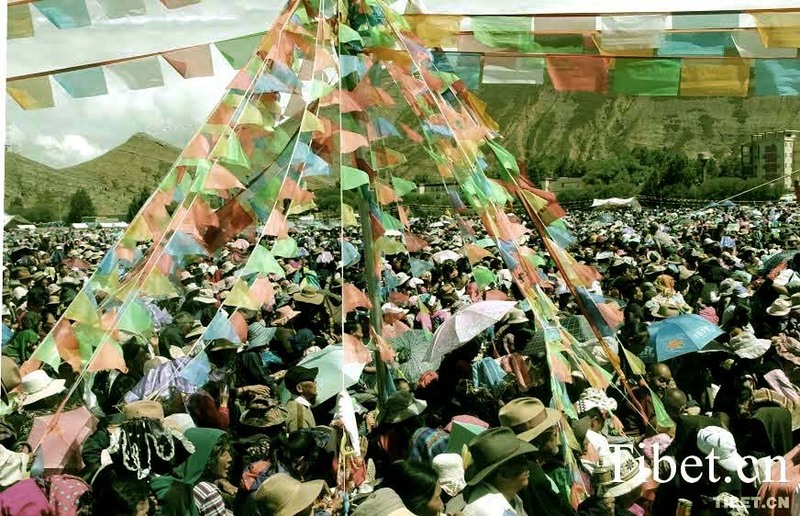 At the start of the initiation, the Tibetan pilgrims tossed silk khata scarves in the direction of the 11th Panchen Lama as an auspicious greeting. The khatas quickly piled up before the crowd. It had rained the night before and drizzled intermittently on the first day but the damp and the cold did not deter the throngs of pilgrims and monastics from attending the event. Just before the afternoon session began, monks in maroon robes carried huge kettles and offered hot tea to everyone, which offered a warm respite from the cold. The monks also distributed refreshments of barley biscuits to the crowd. 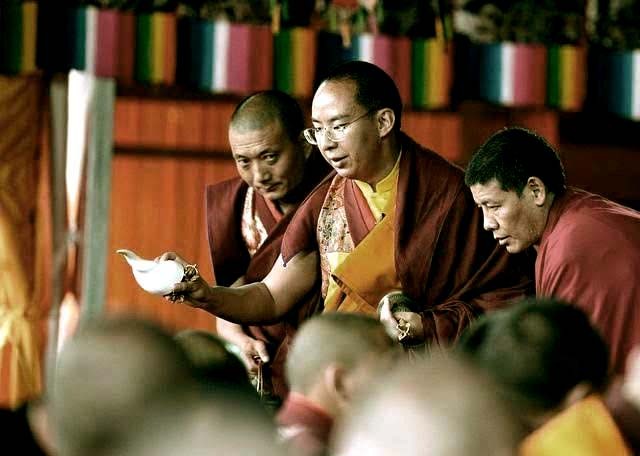 In his opening speech, the 11th Panchen Lama proclaimed the rainfall to be “an auspicious sign,” and recalled that it also rained during the previous Kalachakra initiation that was led by His Holiness the 10th Panchen Lama. He added that the 10th Panchen Lama at that time had explained that the rain indicated purification. The organisers ensured the smooth flow of this grand event by offering various conveniences for the public, which included huge screens displaying the proceedings happening on stage so that even those seated far behind could follow the event closely, a dozen temporary water stations and portable washrooms. In addition, 50 doctors and nurses from local hospitals were assembled into 11 medical squads stationed in various strategic places to provide emergency aid if needed. These are just a reflection of the careful planning and tremendous effort put in by the organisers to ensure the historic and auspicious event went without a hitch. The colourful sand mandala recreates the celestial Kalachakra mandala, which is an essential element in the initiation. 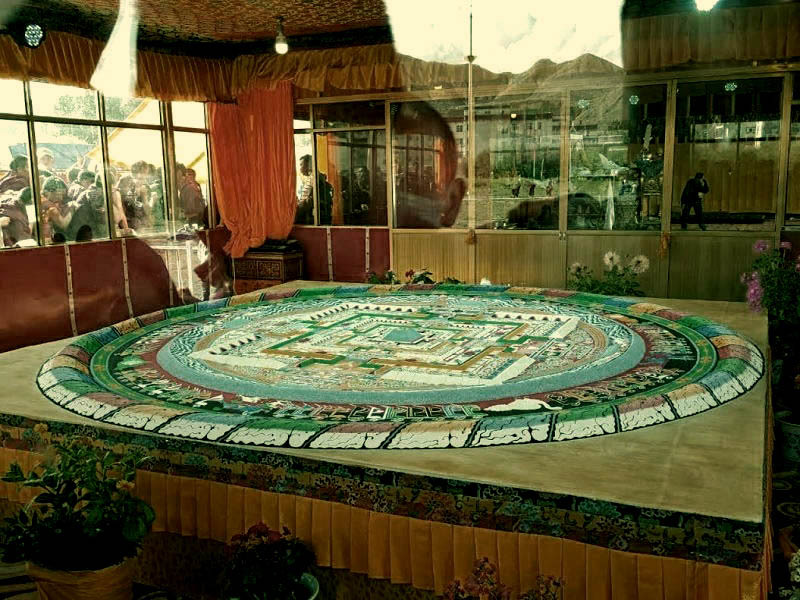 The name Kalachakra literally means the ‘Wheel of Time’ in Sanskrit or Dukyi Khorlo in Tibetan. The Kalachakra Tantra is one of the most advanced Tantric systems within Tibetan Buddhism. It was one of the last great Tantras to be brought over from India to Tibet before the great Indian monasteries and centers of learning were sacked and destroyed by successive Northern invasions. The Kalachakra Tantras are inextricably linked with the legend of the mystical land of Shambhala. 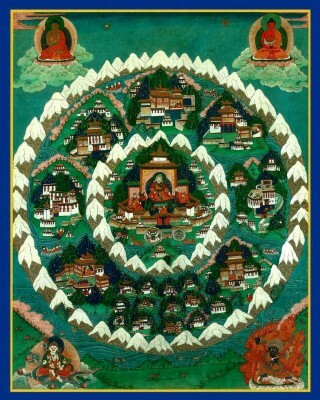 Shambhala is a place on our earth that is described in the commentaries to be a hidden land ruled by enlightened kings. 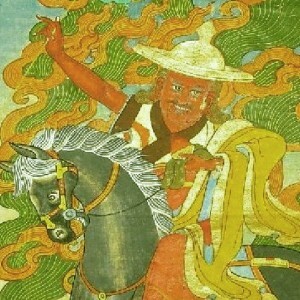 The king of Shambhala is both ruler and lama. The Kalachakra Tantra is the primary practice of the populace of this kingdom and the king is the one who bestows the initiations and commentaries of Kalachakra. In fact, the Kalachakra Tantra states that it was Suchandra, an earlier King of Shambhala, who requested Buddha Shakyamuni to teach a method to practice the Dharma without renouncing worldly responsibilities. 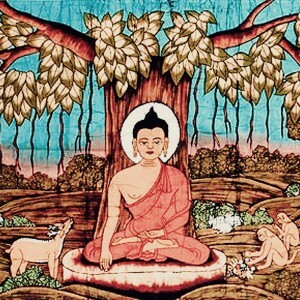 In response to his request, the Buddha taught the first teachings on Kalachakra in Dhanyakataka, which is near modern-day Amaravati in Andhra Pradesh, Southeastern India. Miraculously, the Buddha gave this teaching simultaneously with another teaching on Vulture’s Peak in the state of Bihar. Apart from the king, ninety-six minor kings and emissaries from Shambhala who were amongst the retinue of the king also received the teachings. In this manner, the Kalachakra Tantra was first transmitted directly to Shambhala, where it was kept and practiced for hundreds of years. Successive kings of Shambhala, Manjushrikirti and Pundarika, were said to have composed the condensed Shri Kalachakra Laghutantra and its main commentary, the Vimalaprabha that is at the heart of the Kalachakra texts. 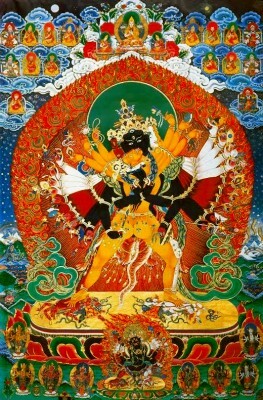 The Kalachakra yidam in the sacred embrace of his consort, Visvamata and the Protector of the Kalachakra tantras, Vajravega or Dorje Shug below. Within Tibet, the Kalachakra Tantra has many lineages but amongst them, there are two main lineages, the Dro and the Ra. The Ra lineage descends from the Kashmiri master Samantashri and the translator Ra Lotsawa Dorje Drak. This lineage eventually found a prominent place within the Sakya School, where great masters like Sakya Pandita, Drogon Chogyal Phagpa and so forth upheld and proliferated it. 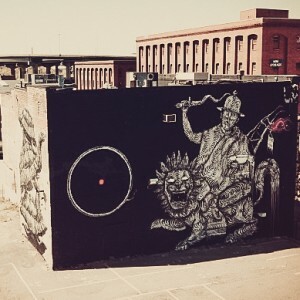 On the other hand, the Dro lineage descends from the Kashmiri scholar Somanatha, who traveled to Tibet in 1027 AD and his translator Dro Lotsawa Sherab Drak, whose name became synonymous with this transmission of the Kalachakra Tantras. The Dro lineage eventually became an integral part of the Jonang lineage through its founder Yumo Mikyo Dorje and Kunpang Tukje Tsondru. Then, the Jonang scholar Taranatha left his mark on the lineage by developing this Tantra with his commentaries and teachings. Concerning the Kalachakra Tantra, you have appeared like King Suchandra himself. 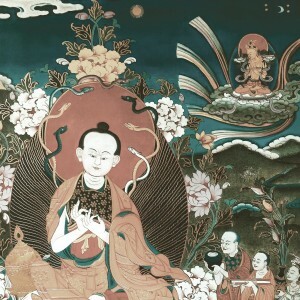 A close disciple of Lama Tsongkhapa and the posthumously recognised 1st Panchen Lama, Khedrup Je composed an important commentary of the Kalachakra Tantra. 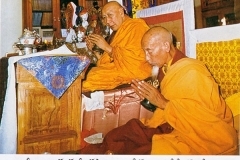 Within the Tibetan spiritual and political sphere, the Dalai Lama and the Panchen Lama are the two highest-ranking lamas. 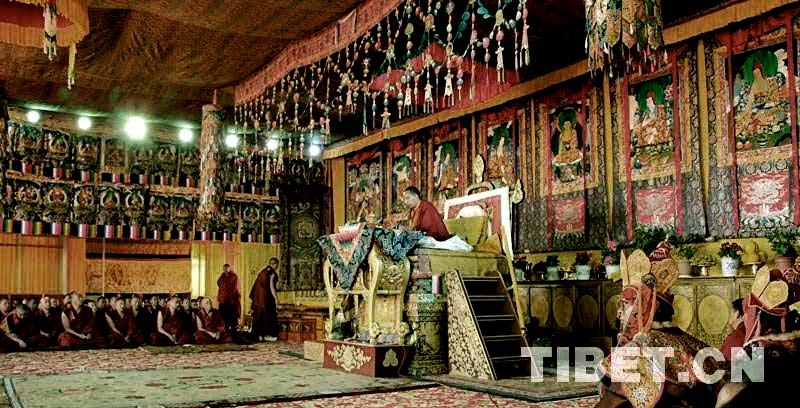 This tradition began since the time of the 4th Panchen Lama Lobsang Chokyi Gyaltsen, who discovered and enthroned the Fifth Dalai Lama Ngawang Lobsang Gyatso in the 17th Century. The Fifth Dalai Lama went on to unify the country and was enthroned as the temporal and spiritual leader of Tibet. 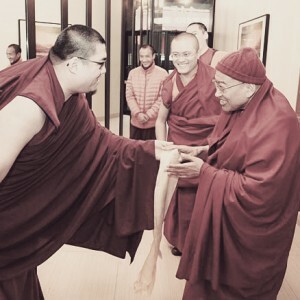 In gratitude to his spiritual master, the Dalai Lama bestowed the title ‘Panchen Lama’ on his own teacher, while posthumously recognizing the three previous Panchen Lamas. The Dalai Lama also established Tashi Lhunpo Monastery as his teacher’s monastic seat. As a young boy, Bainqen Erdini Qoigyijabu was officially recognized and installed as the 11th Panchen Lama on 29 November 1995 after a lot-drawing ceremony from the sacred golden urn in strict compliance with religious rituals and conventions. His given name is Gyaincain Norbu. Gyaincain Norbu was born on 13 February 1990 at Lhari County in northern Tibet. His father and mother both had primary school education. The name ‘Gyaincain Norbu’ which means ‘jewelled victory banner’ was given by his maternal grandfather. 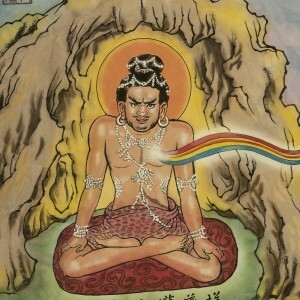 Many auspicious signs were observed surrounding the birth of Gyaincain Norbu. For instance, the boy’s caretaker discovered a white holy Tibetan letter ‘AH’ on his tongue, which signified that the boy was a high incarnation. Meanwhile, the official search for the reincarnation of His Holiness the 10th Panchen Lama began in June 1989. Based on the observations at the sacred lake, divinations and the identifying objects left behind by the late 10th Panchen Lama as well as a comprehensive observation of his countenance and other auspicious signs, three most brilliant candidates were eventually shortlisted. 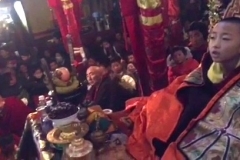 Thereafter, the method of drawing lots from the golden urn was performed before the sacred statue of Jowo Rinpoche in the Jokhang Temple in Lhasa and Gyaincain Norbu was confirmed as the reincarnation of the 10th Panchen Erdeni. 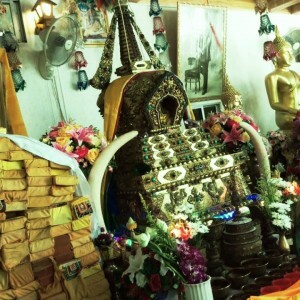 His religious name is Jizun Losang Qamba Lhunzhub Qoigyijabu Baisangbu. 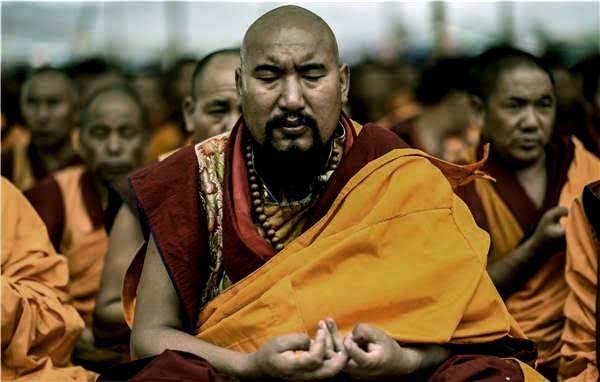 Through the instructions of several tutors and his own diligence since his confirmation, enthronement and ordination, the young Tulku had mastered most of the Sutras and Tantras by the age of 15. He has since grown up to become the religious leader that he is today. He is currently serving as the Vice President of the Buddhist Association of China and recently celebrated the 20th anniversary of his enthronement at his monastic seat of Tashi Lhunpo. 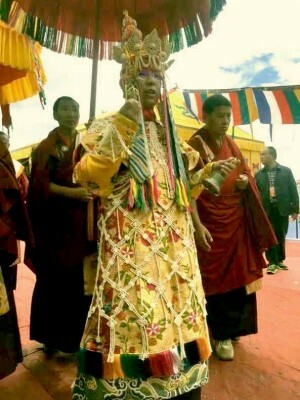 The 11th Panchen Lama is adorned with the bone ornaments of a tantric yogi of the Kalachakra tantras. The Kalachakra initiation is filled with complicated rituals, visualisations and recitations. 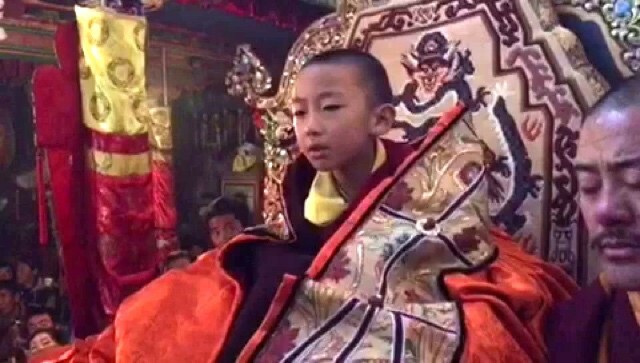 But although relatively young, His Holiness the 11th Panchen Lama was able to bestow the initiation for the first time in a calm, familiar and confident manner, just as he had done in previous lives. 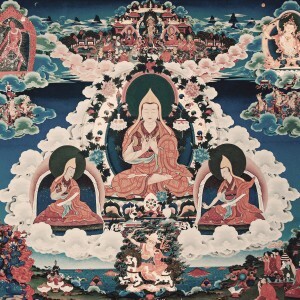 Apart from highlighting the strong connection between the Kalachakra Tantras and the line of Panchen Lamas, this is also indicative of the fact that he was groomed and taught very well by his teachers, especially his root teacher Jamyang Gyatso. In fact, the Panchen Lama has a special chapel in Tashi Lhunpo Monastery dedicated to the practice, mastery and proliferation of the Kalachakra Tantra. All his previous lives practiced and proliferated this Tantra as well. So, the Kalachakra initiation is not something new for the Panchen Lama but a continuation of the practice from previous lives. In fact, the Kalachakra Tantra is a specialty of his incarnation line. Moreover, the Panchen Lama is known to be the emanation of Buddha Amitabha and also the emanation of the king of Shambhala. 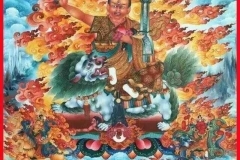 Hence, there is a special significance for the Panchen Lama to be giving this initiation given the connection between the Kalachakra Tantras and the land of Shambhala. In actuality, any lama or practitioner can receive the Kalachakra initiation, engage in the necessary requirements and bestow the initiation upon others. 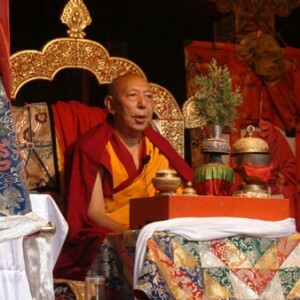 In order to give the initiation, one must first have received the initiation from a qualified Lama holding the Kalachakra lineage and then practice Kalachakra single-pointedly and engage in the fire puja upon completion of the required retreats. If requested, they may then give this initiation to others just like the Panchen Lama. Therefore, one does not need to be the Dalai Lama, Panchen Lama or any High Lama sitting on a throne to be giving this initiation. Any practitioner who has completed the requirements may give this initiation. 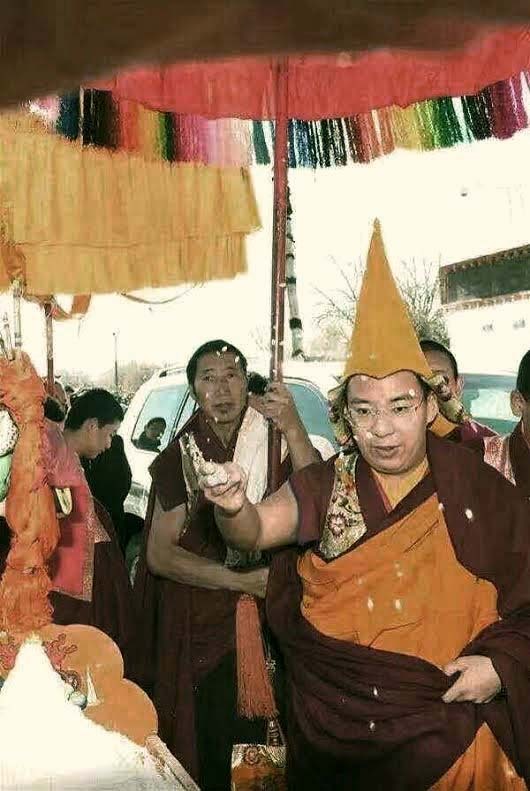 Therefore, contrary to the claims of some who say that this Kalachakra initiation is invalid because the Panchen Lama is not the rightful incarnation, it does not matter if the Panchen Lama is the ‘real’ or ‘fake’ one. 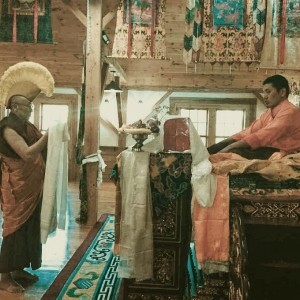 As long as this young lama has done the practice according to the ancient rites and rituals as laid down in the texts, then the initiation is real and an initiation transmission was bestowed on the initiates. Therefore, it is illogical to claim that the initiation is not authentic and anyone who tries to do so is displaying a deep ignorance of the tantric teachings (specifically the Kalachakra Tantra) and how it is transmitted. 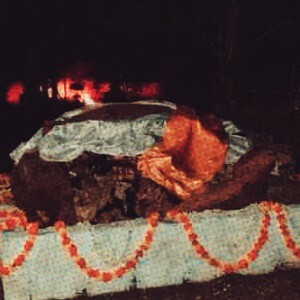 According to news reports, the initiation was state sponsored by the Chinese government and as such, the monks and the organising committee had the resources to ensure the event was well-planned and successfully executed. Interestingly, the Chinese government is encouraging religious freedom by allowing and sponsoring an event of this nature. 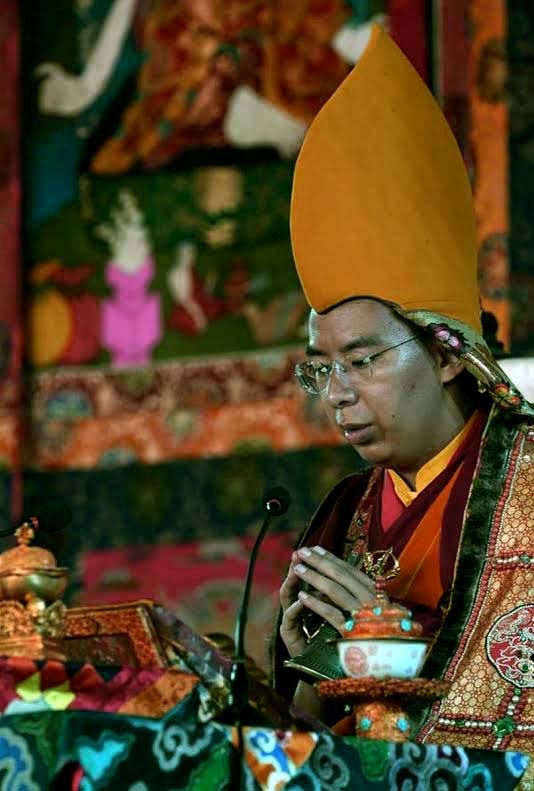 In fact, His Holiness the 11th Panchen Lama welcomed everyone to be a part of the Kalachakra initiation and there were no restrictions as to who could attend the teachings. With over 100,000 people in attendance, it shows that the influence of the young Panchen Lama is growing and will continue to grow even more. 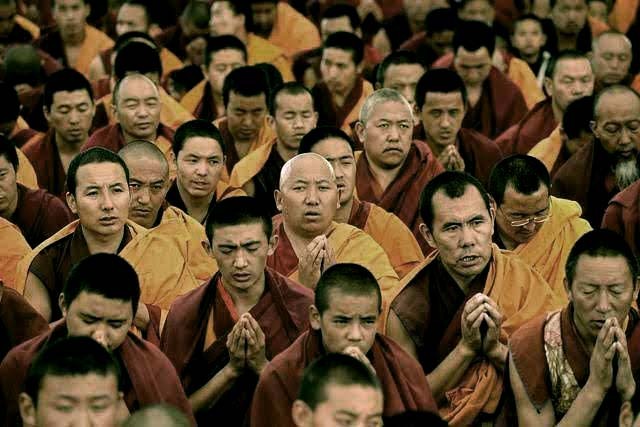 This in turn means that many Tibetans will become his disciples and therefore, the claim that he is a fake Panchen Lama will have less and less of a foothold. No self-respecting Tibetan would tolerate having their lama slandered with claims that he is false and a ‘fake’. The ascending stature of the Panchen Lama will no doubt scare his detractors because his spiritual clout will only grow bigger especially if he bestows the Kalachakra initiation on a regular basis. His influence over the Tibetans will eventually eclipse theirs because he is young, energetic and has the Chinese government as his powerful ally and patron. In fact, the 11th Panchen Lama is slowly but surely blossoming and reaching out to many more people and his detractors will have less and less of a basis to criticise him. 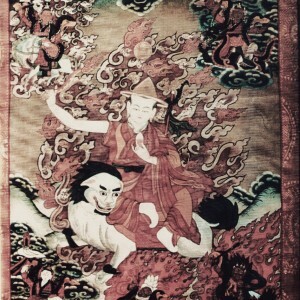 According to Tibetan Buddhist beliefs, if the wrong person is enthroned as a lama, the merits of the lama’s incarnation line would be detrimental to the pretender. Therefore, a false lama’s works and teachings will not grow and the lama himself will have a short life. However, as the current Panchen Lama is growing from strength to strength, this proves that he is indeed the unmistaken incarnation. 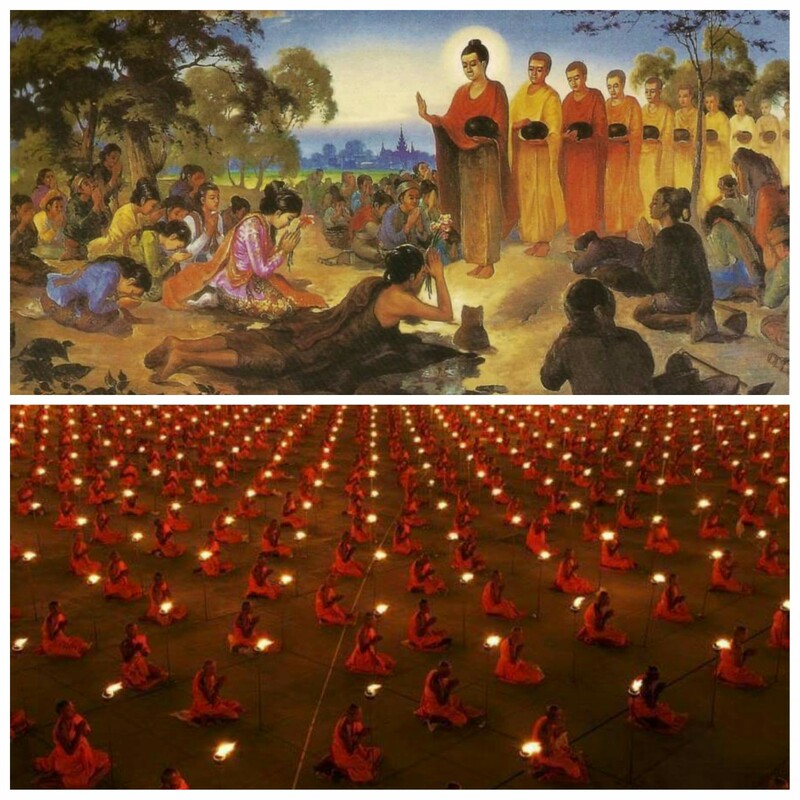 Over 100,000 people, both monks and laypeople, were in attendance. In fact, the success of this Panchen Lama goes to show that the Chinese government is able to groom a high Lama to be highly beneficial, and this is not the first time they have done so as we can see in the case of the 10th Panchen Lama. In the 1950s, the Dalai Lama had recognised his preferred candidate as the reincarnation of the 9th Panchen Lama, while the Chinese Kuomintang government enthroned their own candidate, Lobsang Trinley Lhundrub Chokyi Gyaltsen. 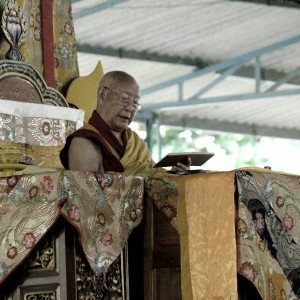 The Chinese candidate eventually became much more famous and influential, thus forcing the Dalai Lama to recognise him as the rightful Panchen Lama and relegate his original candidate to be the Panchen Otrul Rinpoche, which signifies that he is an emanation of the Panchen Lama but NOT the main incarnation. It also logically follows that if the Panchen Lama’s influence is on the rise, this would also have a positive impact on the growth of Dorje Shugden’s practice. 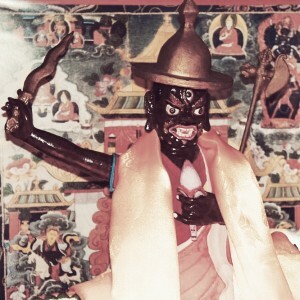 Historically, one of the main Protectors of the Panchen Lamas is Dorje Shugden and he is also the Protector of Tashi Lhunpo, the monastic seat of the Panchen Lamas. In fact, there is a huge chapel at Tashi Lhunpo Monastery dedicated to the practice of Dorje Shugden. 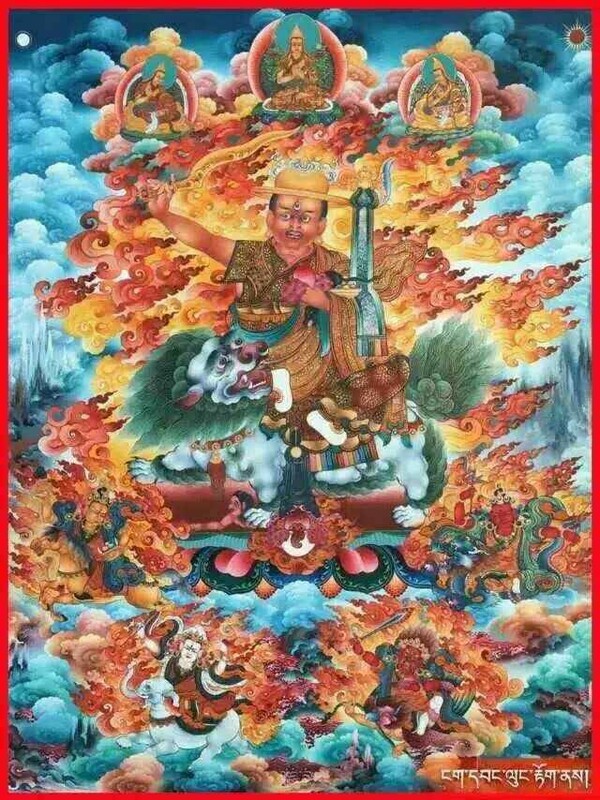 Therefore, the popularity of Dorje Shugden’s practice will most certainly rise in line with the Panchen Lama’s fame and influence. By tradition, most Maha Anuttarayoga Tantra class initiations like Heruka Chakrasamvara, Guhyasamaja and so forth would never be given to the masses. This is because they are supposed to be given only to a select few, highly qualified disciples who have guru devotion, are able to hold vows and commitments, have completed the preliminary practices and whose minds are stabilised by the Three Principle Aspects of the Path. Hence, teachers would closely check and screen their students before giving any higher Tantric empowerments and in the end, only a handful of disciples usually qualify to receive the initiation. Thus, the giving or not giving of an initiation is done out of compassion, so that qualified disciples are able to reap the full benefit of these powerful practices and so that unqualified disciples will not have to suffer the consequences for not being able to maintain the commitments. 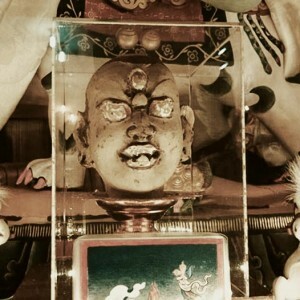 However, the Kalachakra Tantra is an exception because the initiation can be given to the masses and has various benefits according to the level of the practitioner. 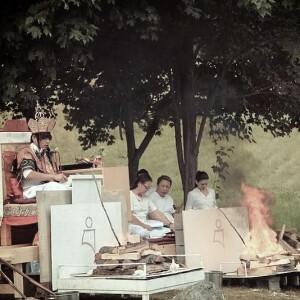 For the highest practitioner, he or she will achieve Enlightenment through this practice; for the middling practitioner, he or she will continue to practice the Dharma in this and future lives; and for the lowest practitioner, he or she will be able to take rebirth in Shambhala through sincere practice although they may not achieve high attainments. Lastly, those who attend the initiation but do not practice will have the powerful blessings of Kalachakra planted in their mindstreams so that in the future, they too may be able to take rebirth in Shambhala as well. A simple map of the mystical Shambhala Kingdom within the vast Himalayan Mountains. 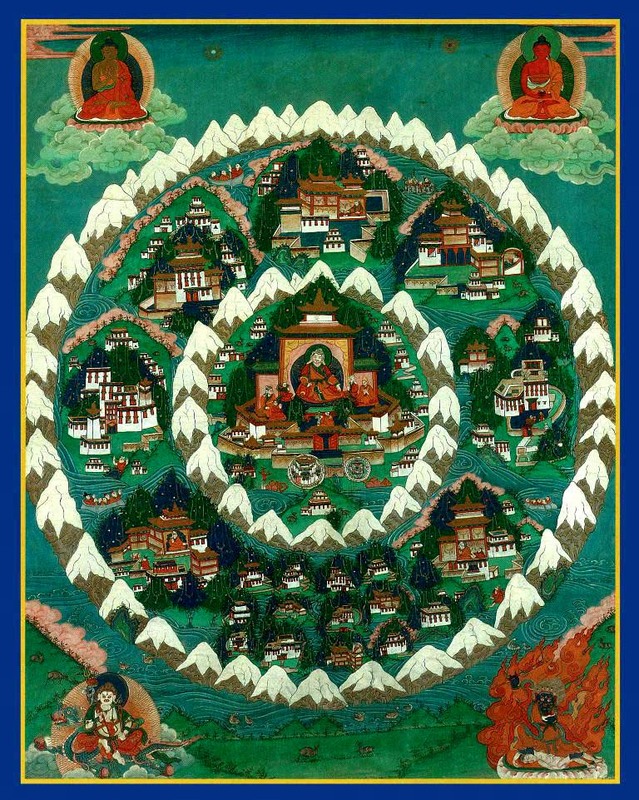 The King of Shambhala is usually depicted in the center of his kingdom with the various parts of this realm surrounding him and protected by a concentric ring of vast snow mountains. The Kings of Shambhala often give Kalachakra teachings to enlighten the spiritual growth of their subjects. The mystical kingdom of Shambhala is geographically located on our earth. As such, we have a stronger connection to this place and it is easier for us to take rebirth there compared to other pure lands. Therefore, when the Kalachakra initiation is given to the masses, the imprints and blessings of Kalachakra are planted in the minds of the masses and the causes are created for them to eventually take rebirth in Shambhala. That is the main reason why this particular initiation is given on a massive scale by the Panchen Lama who is the emanation of the Shambhala kings, whose sole purpose is to liberate as many beings as possible. 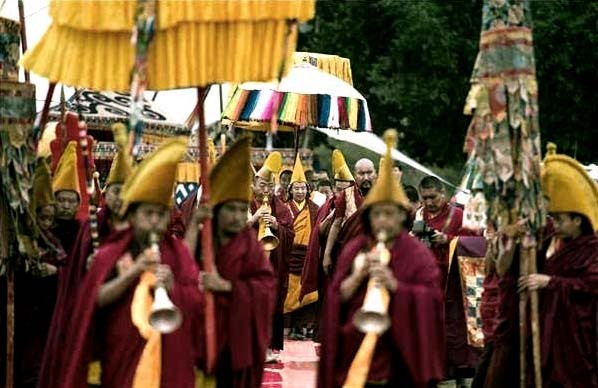 No matter how exotic and elaborate the rituals, the Kalachakra initiation and practice embodies the spirit of Mahayana Buddhism – liberation of others and oneself. And the Kalachakra initiation given by His Holiness the 11th Panchen Lama is definitely an event to rejoice at, and can be seen as a powerful indication of the Dharma growing and spreading from China to beyond. Making a mandala offering to the 11th Panchen Lama. 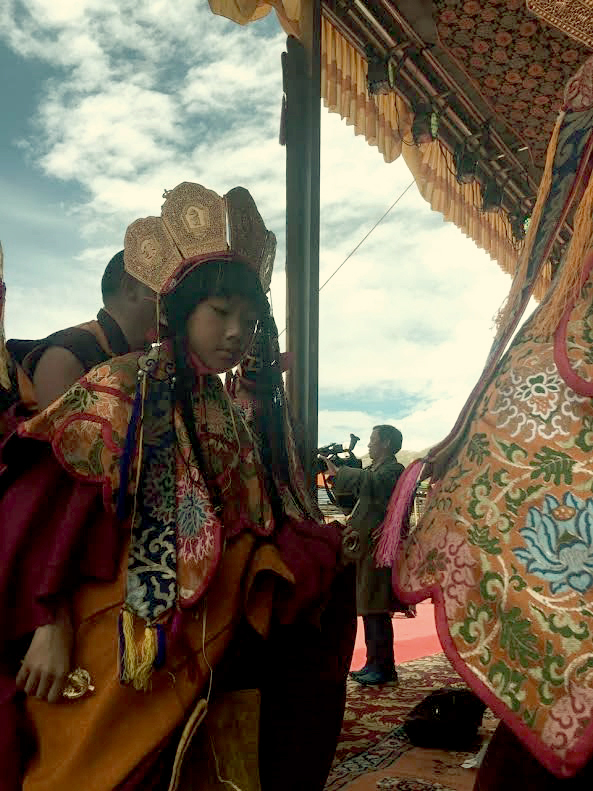 The 11th Panchen Lama Bainqen Erdini Qoigyijabu is ushered to the initiation canopy with the traditional accompaniment of ritual music, parasol, victory banners, incense and so forth. 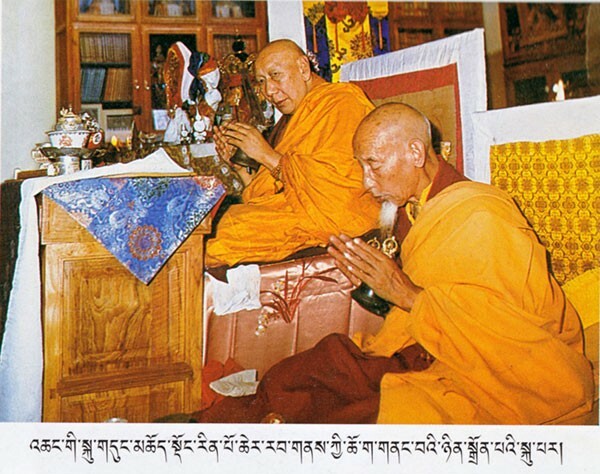 The Panchen Lama is resplendent while presiding over the Kalachakra initiation with the help of assistant monks. 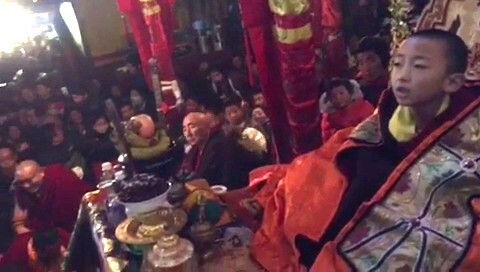 The 11th Panchen Lama engaging in one of the many rituals required during the Kalachakra initiation. 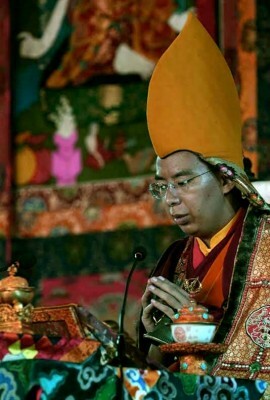 The young incarnation of Denma Gonsa Rinpoche is one of the many great lamas and teachers who are attending the initiation. 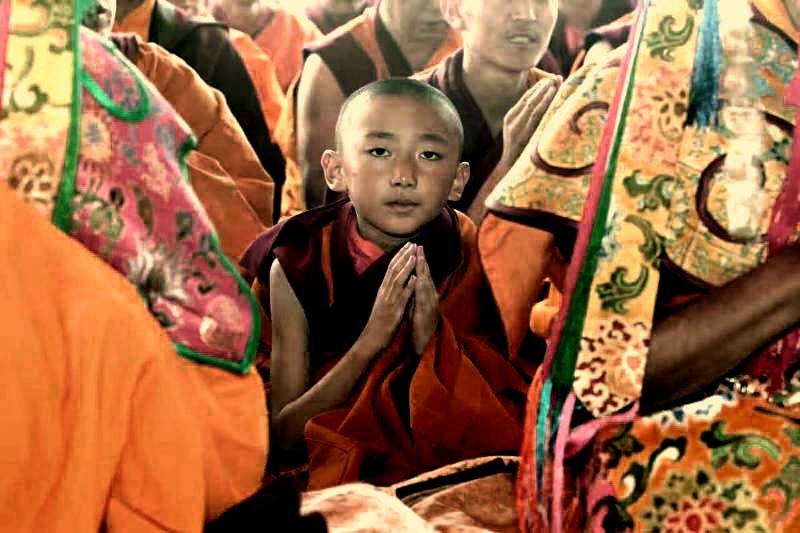 The young Denma Gonsa Rinpoche adorned in dakini robes while engaging in one of the Kalachakra initiation rituals. The 11th Panchen Lama making the auspicious gesture of throwing rice into the air. This is such an auspicious event. 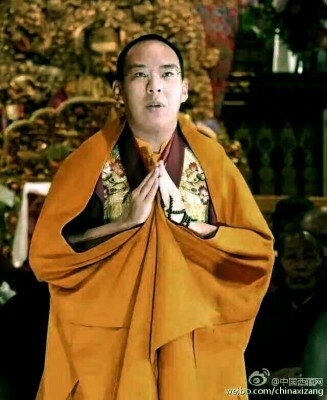 I am sure many like me will rejoice in the Dharma received by this great 11th Panchen Lama. I think the Tibetans have even more reason to celebrate and happy because this is first mass initiation in the past 50 years. Just like in the video, the interviewee said her mother was at the initiation conferred by the 10th Panchen Lama some decades ago. I can only imagine the joy they have. It is also great to see many venerable masters such as His Eminence the 20th Denma Gonsa Rinpoche, His Eminence Nyitrul Rinpoche, Venerable Lama Wangchuk etc were attending the initiation as well. 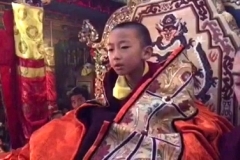 From the video, we can see that the 11th Panchen Lama, although He is quite young, He is very confident in delivering the initiation. I guess that is his many lifetime of practice which gave him the kind of charisma and confidence. I pray that this kind of initiation can be held on a regular basis, such as once a year, as such initiations can benefit everyone at different levels as explained in this article. China has a long history with Buddhism, and I pray that this initiation will “wake up” the spiritual minds, to practice Dharma, to become a better person, to become less anger, and eventually to benefit the whole country and planet earth. May 11th Panchen Lama live long to benefit millions. 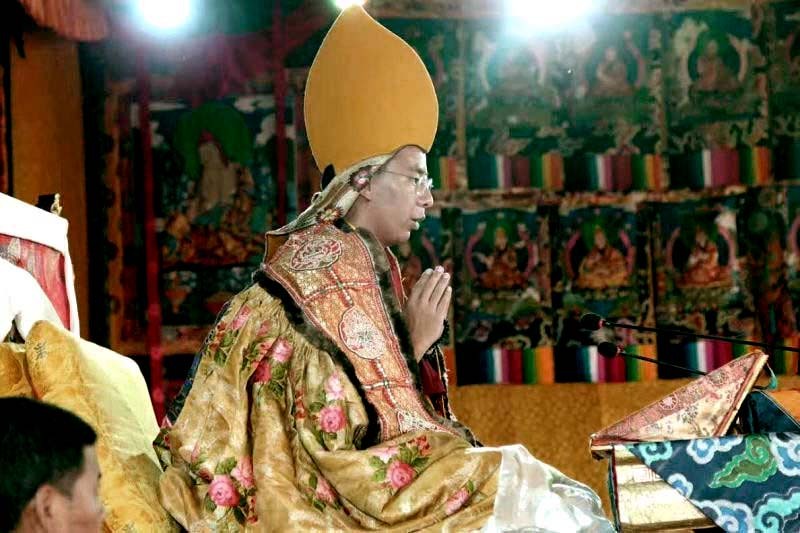 A refreshing news about the 11th Panchen Lama Baingen Erdini Qoigyijabu giving Kalachakra Tantra initiation. The Kalachakra initiation is not something new for the Panchen Lama but a continuation of the practice from previous lives. In fact, the Kalachakra Tantra is a specialty of his incarnation line. Kalachakra Tantra was a teaching by Buddha Shakyamuni by the request of Suchandra (a King of Shambhala). It is a method to practice Dharma without renouncing worldly responsibilities. 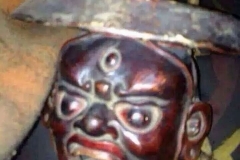 It is now one of the most advanced Tantric systems within Tibetan Buddhism. The initiation event was state fully supported and sponsored by the Chinese government, which guaranteed the success of the event. In a way, it is the Chinese government way of demonstrating their eagerness in rectifying their close-door policy and how they are embracing religious freedom. Everyone is welcome to attend this event. It is a stark contrast to events organized by Dharamsala that applies exclusion policies that restrict Dorje Shugden practitioners from attending. To those of us who are not aware, Tibetans are fiercely loyal to their Guru. 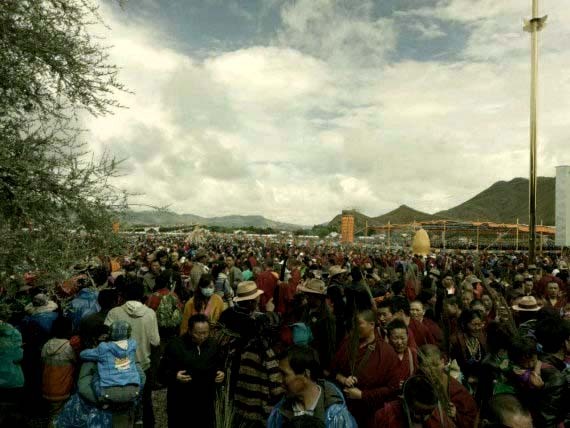 With over 100,000 people in attendance, it shows that the young Panchen Lama’s base of loyalist is growing and growing strong. This literally means that more and more Tibetan are ready to defend Panchen Lama and his teaching. 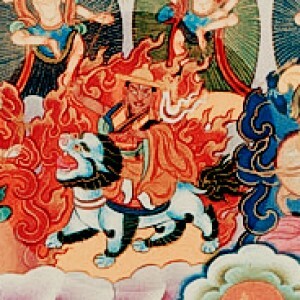 Historically, Dorje Shugden is one of the main Protectors of the Panchen Lamas as well as Tashi Lhunpo, the monastic seat of the Panchen Lamas. We will most certainly see the rise of Dorje Shugden’s practice alongside the fame and influence of the 11th Panchen Lama. 1. Sponsored by the Chinese government, this event drew over 100,000 practitioners per day, including over 100 Tulkus and teaching Lamas. This is a very good show of the Chinese government’s claim and support on religious freedom. 2. With the 11th Panchen Lama giving this Kalachakra initiation and the length to which the practitioners would go to in order to attend, shows the powerful draw of Tibetan Buddhism and the loyalty & faith of the practitioners in His Holiness is high. 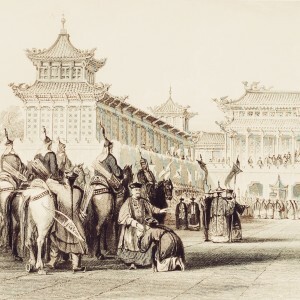 May the people of China be blessed to receive and practise the dharma that had been with them for centuries, where Kings and Emperors support the spread of dharma. 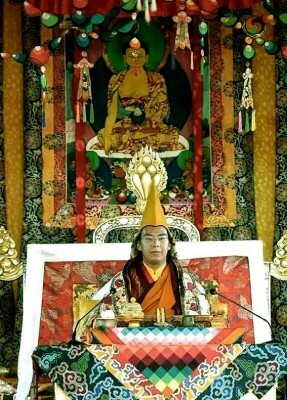 May His Holiness the 11th Panchen Lama have long healthy life to continue turning the wheel of dharma . An absolutely joyous article to read. 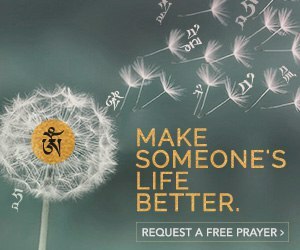 Thank you dorjeshugden.org for bringing to our knowledge of such an auspicious event. 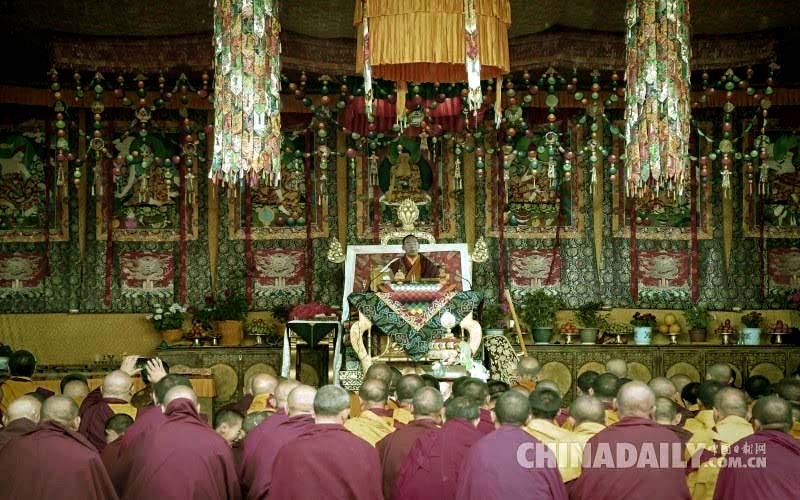 Rejoice to the people who are able to attend to this auspicious Kalachakra Tantra initiation presided by HH the 11th Panchen Lama publicly in China. It is great to see over 100,000 people attended the initiation which also included many high incarnated lamas. 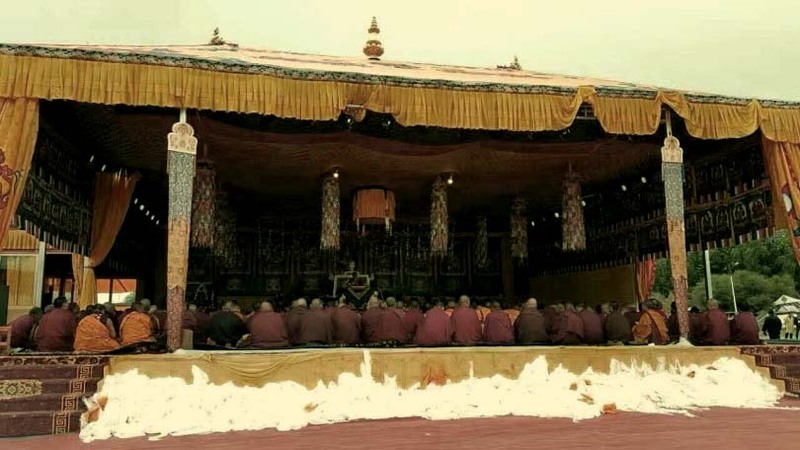 This showed that if HH the 11th Panchen Lama was a fake reincarnation, he may not able to perform well for the Kalachakra initiation in front of this big crowd. If HH the 11th Panchen Lama is wrongly enthroned or he is false, he should has no great merits to support him in the spreading dharma. However, what we can see now the young 11th Panchen Lama is become famous and his teachings are accepted by the people. I personally would think this is because there is no restriction to attend this event and everyone is welcome and definitely including Dorje Shugden practitioners. This will encourage more people to follow and listen to HH the 11th Panchen Lama’s teaching in the future. The mammoth crowd that attended the recently held Kalachakra initiation is I believed to be unprecedented I really cannot fathom the unimaginable logistics in the planning of this event, crowd control, rest room facilities, evacuation plans, the meals arrangement and medical aids. Above it all it ended without any unusual incidences. 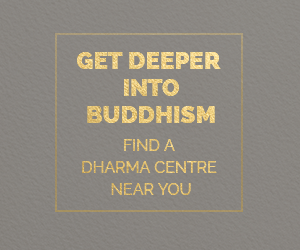 As a Buddhist I am extremely proud of my fellow Buddhist that this event went well but most importantly many have braved over unannounced painstaking troubles couple with very inconvenience journeys to attend this holy event. 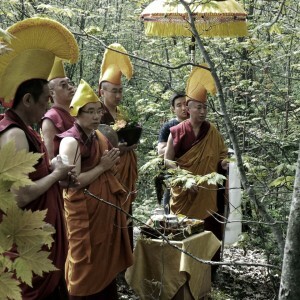 They believed that this initiation is a blessing from the enlightened and it has also opened a new chapter in Tibetan Buddhism to come together as one. The announcement from this highly respected and regarded Panchen Lama that this blessing is opened to all illustrate that he is very enlightened, compassionate and with penetrative wisdom. Tibetans worldwide should now be able to perceive the openness statement of the 11th Panchen Lama with grace and acceptance that since all are invited the Dorje Shugden segregation and controversy must end and put behind us. It is also our fervent hope that all Tibetans regardless of their faiths and beliefs must embrace this new chapter with hopes, faith and believes that a new horizon is waiting for all. This is HUGE! The number of people who attended this Kalachakra initiation is just mind blowing! Imagine being one of the fortunate ones to receive this sacred initiation. There are many salient points in here, but these 4 stood out to me the most. 1) Panchen Lama is known to be the emanation of Buddha Amitabha and also the emanation of the king of Shambhala. 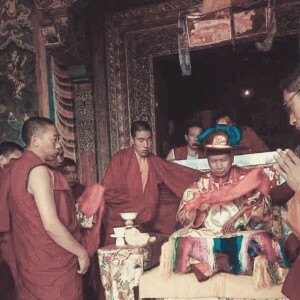 Hence, there is a special significance for the Panchen Lama to be giving this initiation given the connection between the Kalachakra Tantras and the land of Shambhala. 2) According to Tibetan Buddhist beliefs, if the wrong person is enthroned as a lama, the merits of the lama’s incarnation line would be detrimental to the pretender. Therefore, a false lama’s works and teachings will not grow and the lama himself will have a short life. However, as the current Panchen Lama is growing from strength to strength, this proves that he is indeed the unmistaken incarnation. 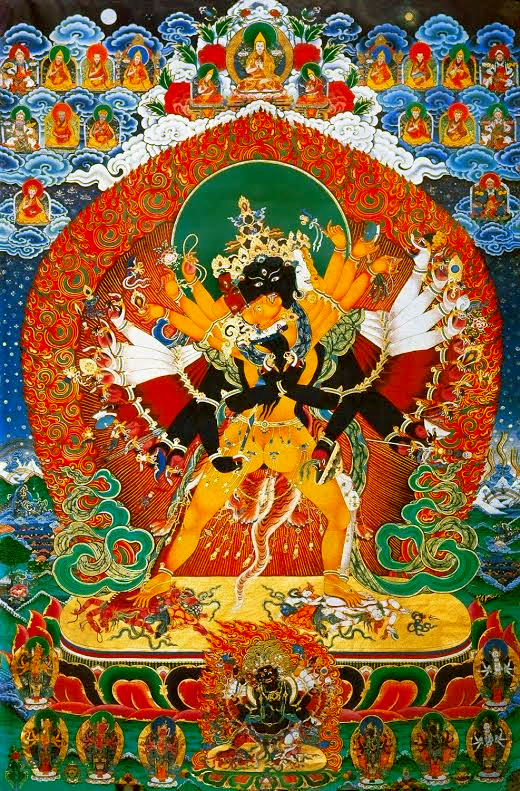 3) Kalachakra Tantra is an exception because the initiation can be given to the masses and has various benefits according to the level of the practitioner. For the highest practitioner, he or she will achieve Enlightenment through this practice; for the middling practitioner, he or she will continue to practice the Dharma in this and future lives; and for the lowest practitioner, he or she will be able to take rebirth in Shambhala through sincere practice although they may not achieve high attainments. Lastly, those who attend the initiation but do not practice will have the powerful blessings of Kalachakra planted in their mindstreams so that in the future, they too may be able to take rebirth in Shambhala as well. 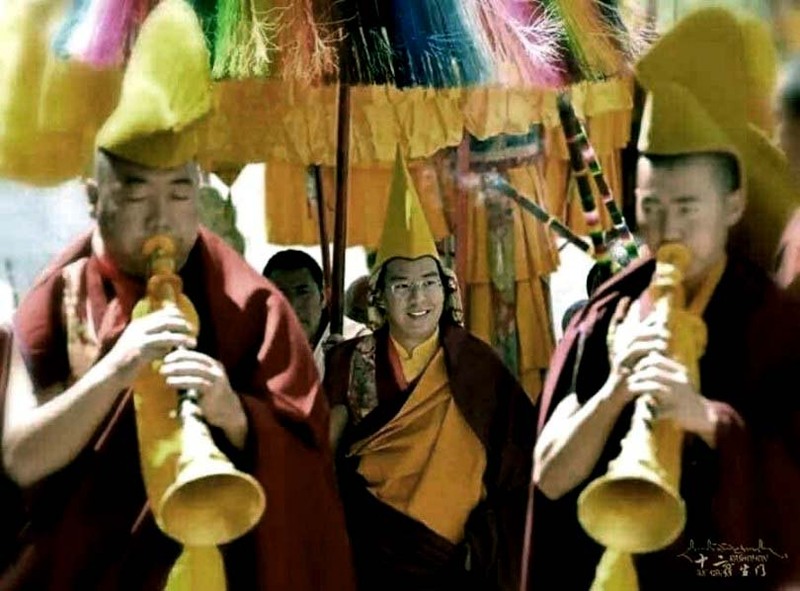 4) The main reason why this particular initiation is given on a massive scale by the Panchen Lama who is the emanation of the Shambhala kings, whose sole purpose is to liberate as many beings as possible. There are many who claim that His Holiness the 11th Panchen Lama Bainqen Erdini Qoigyijabu is not the “real” Panchen Lama but the fact that his sole purpose of giving this initiation to such a huge number of people is to liberate them, speaks for itself. 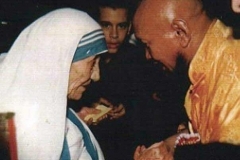 To me, his pure motivation shows me who His Holiness really is. I totally agree with the sentence “it does not matter if the Panchen Lama is the ‘real’ or ‘fake’ one. 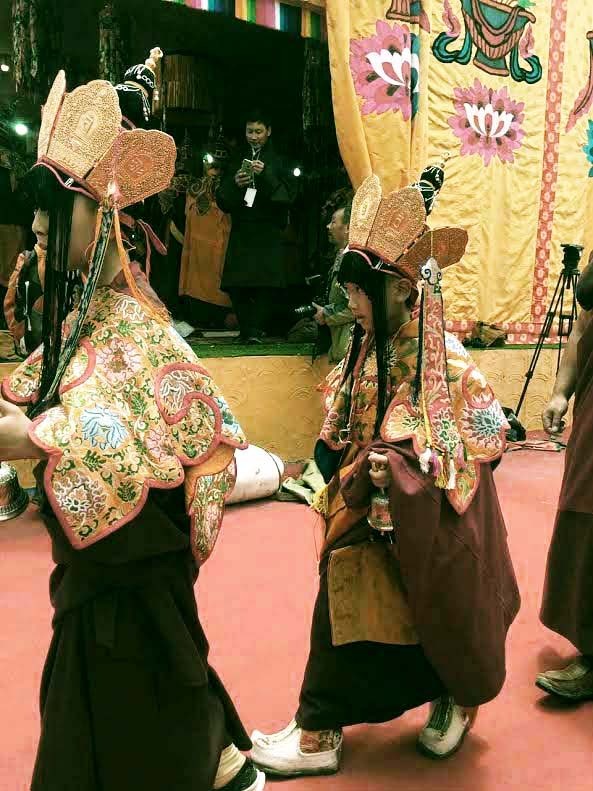 As long as this young lama has done the practice according to the ancient rites and rituals as laid down in the texts, then the initiation is real and an initiation transmission was bestowed on the initiates. 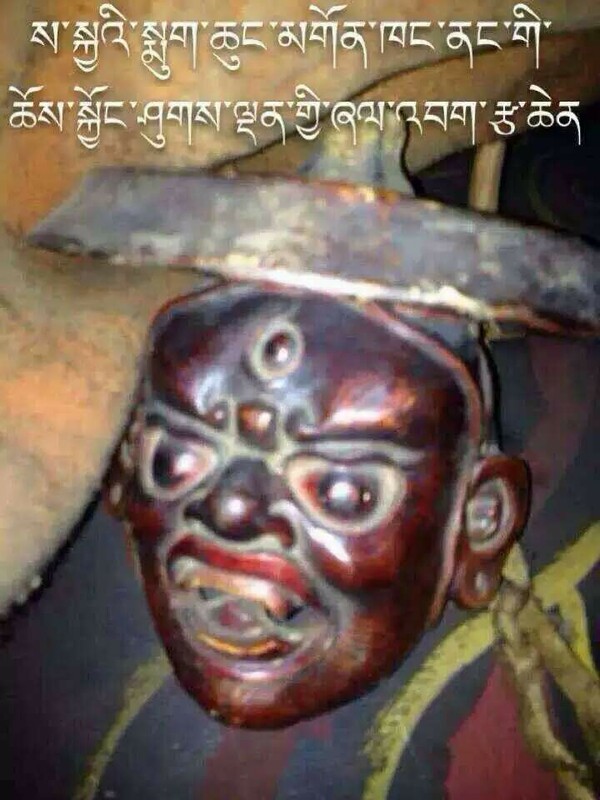 Therefore, it is illogical to claim that the initiation is not authentic and anyone who tries to do so is displaying a deep ignorance of the tantric teachings (specifically the Kalachakra Tantra) and how it is transmitted.” This also applies to Dorje Shugden practitioners. 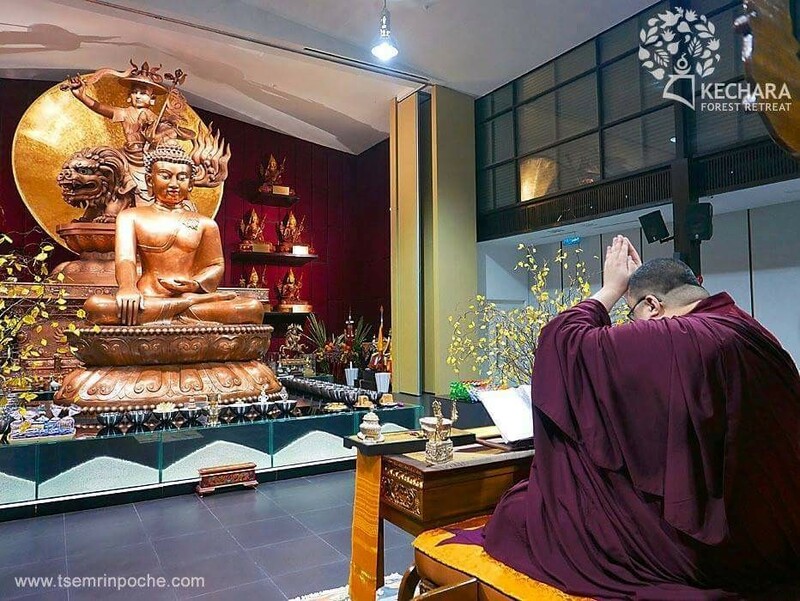 Many high Lamas have been practising Dorje Shugden and there is nothing wrong with them. If they were practising demon, then they would have been experiencing something not so good. One thing is for sure. China is promoting religion freedom to the citizens in Tibet and China. This is the first time it is done in a Chinese soil for many many years. 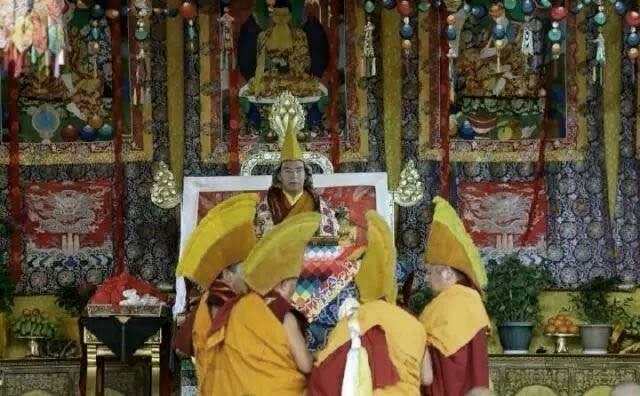 It is great to see The Panchen Lama is now able to conduct initiations continuing what His previous reincarnation did and in such as this on a grand scale. So it is rejoicing news! 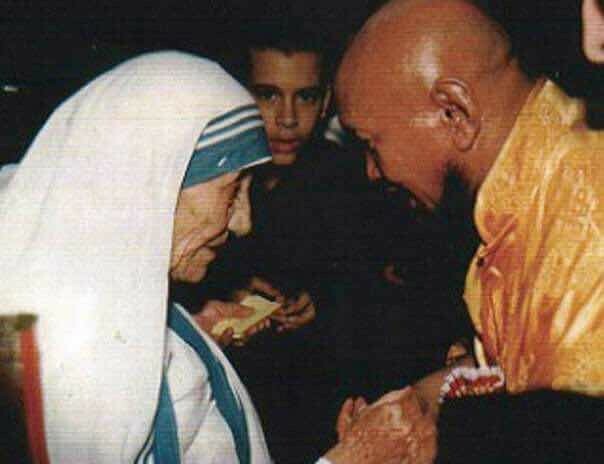 May His Holiness live long! The Kalachakra Tantra is a specialty of the Panchen Lama incarnation line. 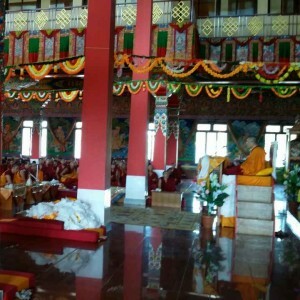 This is the first Kalachakra initiation to be held publicly in Tibet/China in the last 50 years presided by the young His Holiness the 11st Panchen Lama on 21 July 2016. His Holiness the 11st Panchen Lama welcomed everyone to take part in The Kalachakra initiation and there were no restrictions on who could attend the teachings. There were 100,000 people attending the initiation. Chinese government has shown to many that China has religious freedom because they were supporting in many ways to make sure this event running smoothly. This is an indication that the Dharma is growing and spreading from China to beyond.